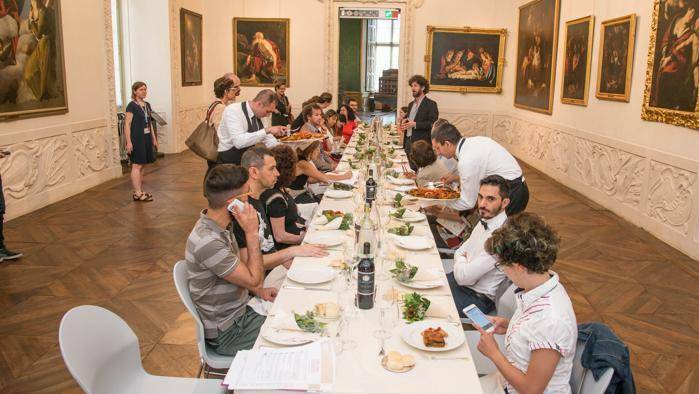 Time Table – Tavola dei Secoli’ is an exhibition taking place at the Palazzo Madama in Turin, which will run from the 24th of June until the 18th of October. Inspired by the 2015 Milan Expo, whose main theme is ‘feeding the planet’, ‘Time Table’ takes food as its central theme. .
‘Time Table – Tavola dei Secoli’ is an exhibition taking place at the Palazzo Madama in Turin, which will run from the 24th of June until the 18th of October. Inspired by the 2015 Milan Expo, whose main theme is ‘feeding the planet’, ‘Time Table’ takes food as its central theme. From the Renaissance till the end of the twentieth century, the exhibition illustrates the allegorical importance of the tavola imbandita – loosely translated as the ‘lavishly decked table’- throughout history. The dining room has forever represented a prime opportunity for family and friends to socialize, bond and share tales from the day’s events. The exhibition attempts to capture the importance of dining in making monumental decisions of great importance, as well as in love lost and love found throughout history. The Palazzo Madama has been decorated with 6 tables placed circularly around a central fulcrum shaped like the hands of a clock, with each hand symbolizing different historical periods. Each table contains objects crafted by artists and artisans designed to echo the themes of both conviviality and weighty importance throughout time. Plates, bowls, flasks and bottles from several historical periods all form part of the ‘Time Table’ exhibition; the relatively modest bowls of the 1400s, the Renaissance-era majolicas decorated with allegories, and the colourful, decorative Bourgeoisie designs of the 1900s all serve to echo the aforementioned themes reinforcing the importance of the tavola imbandita. Tables with other classic symbols of the household, including board games, musical instruments, furniture and even a newly-renovated Emperor’s gown have also been included in the exhibition in order to capture the ambiance of dining rooms throughout history. Other galleries have also been dedicated to items such as bowls and sacred vases traditionally used during the Lord’s Supper and other church services. Although most of the 180 items on display form part of the museum’s permanent collection, some items, such as a rare 17th century mandolin and an ivory & ebony cabinet, had never been publically displayed prior to the exhibition’s opening. Overall, ‘Time Table- A Tavola dei Secoli’ is a novel exhibit which aims to illustrate the dynamic nature of dining in the household throughout history by focusing on the evolution of many of its key components – particularly that of the table – from the Medieval period till the late 20th century.